From theory to application, fourth-year engineering students at the University of Delaware recently tapped into their knowledge to create products and solutions for industry sponsors. For the Senior Engineering Design program, 228 students from four engineering majors (mechanical engineering, biomedical engineering, electrical engineering and environmental engineering) were split into 44 teams to solve problems for 34 sponsors, companies such as Air Liquide, ILC Dover, Xergy, Christiana Care and more. 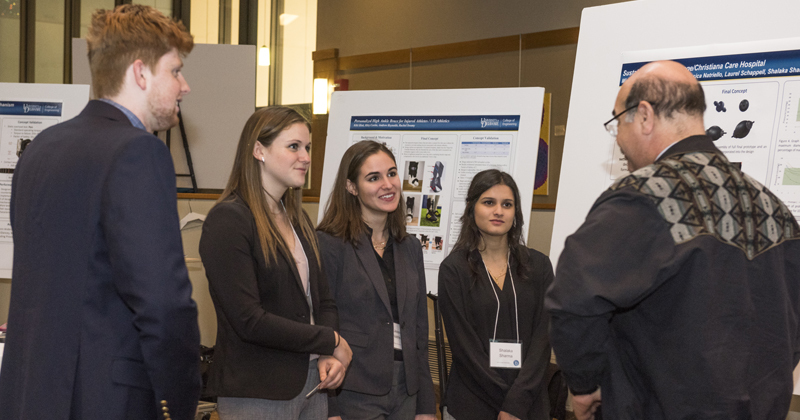 The teams were guided by 16 faculty members, and their projects were judged by 56 evaluators, including professors and industry experts, at the Senior Engineering Design Celebration on December 12, 2018 in UD’s Clayton Hall. Five teams of high school students from Padua Academy in Wilmington also participated, showcasing devices they had designed to help patients with a fear of needles. Senior Engineering Design asks UD engineering students to synthesize their educational experience to tackle a problem under real business conditions, such as budgetary and time constraints. This experience prepares students for the types of challenges they might encounter in their first jobs and gives them fodder for job interview questions.